Synovial fluid aspiration is the present gold standard used to diagnose gout and confirm the presence of monosodium urate (MSU) crystals. However, dual energy CT (DECT) scans are increasingly being substituted for this invasive technique because clinical studies are demonstrating an up to 95% sensitivity of diagnosis. A German study conducted to evaluate the impact DECT scan can have on the treatment regimens of patients suspected of having gout showed that findings from the exam modified planned or current treatment for over 90% of the participants. Although the patient cohort consisted of only 39 patients, the multi-disciplinary research team of radiologists, rheumatologists, and nephrologists from the Clinic of Goethe University in Frankfurt now recommend that DECT should be performed as part of the clinical workup of patients with suspected gout to verify or rule out the disease under certain circumstances. This test is not used for patients who can be diagnosed with a clinical examination, but ratherw hen patients who are suspected to have gout but whose clinical presentation is not typical or who have co-existing rheumatic disease or osteoarthritis. A DECT scan is commonly ordered for clinical scenarios that make it difficult to find the correct diagnosis fast and begin targeted therapy. For the study, the researchers identified patients who had a DECT exam at the Clinic over a 36 month period. They retrospectively analyzed the rheumatologic and clinical history of 39 patients, nine of whom had a known prior history or current diagnosis of gout. The clinical history included documented uric acid serum levels, treatment regimens, and medication prescribed before and after the DECT exam. Then they analyzed DECT datasets of the feet, knees, and hands, detecting MSU crystals in 23 joints of 23 patients. Sixteen of these patients had not been diagnosed with gout before having a DECT scan. Three of the nine patients with a known history of gout had negative MSU crystal findings on the DECT scan. Coauthor professor of radiology Ralf W. Bauer, M.D. of the department of diagnostic and interventional radiology, and colleagues, determined that of the 36 patients who had a positive diagnosis, 22 patients had their treatment modified to gout-specific therapy, and 14 patients had regimen modifications that targeted other rheumatic diseases the DECT scan identified. Specifically, current treatment regimens were modified based on DECT findings in 92.3% of the cases, with treatment alterations in 58.3% of patients with positive findings of MSU crystals, and modified from a nonspecific target inflammation therapy to a gout-targeted therapy in 35.9% of cases. Metzger, SC, Koehm M, Wichmann, JL, et al. 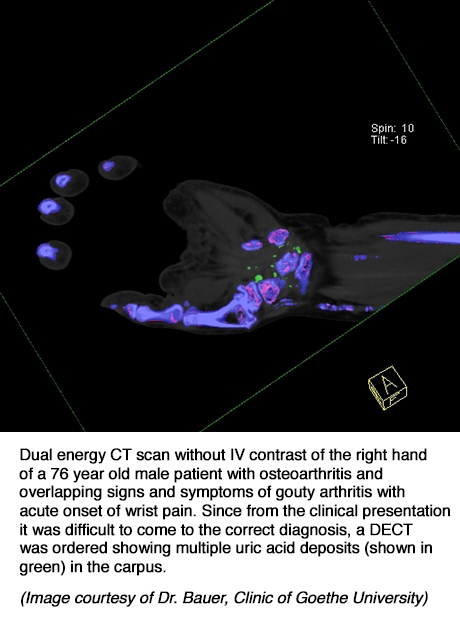 Dual-Energy CT in Patients with Supected Gouty Arthritis: Effects on Treatment Regimen and Clinical Outcome. 2016 Acad Radiol. 23;3:267-272. Dual-energy CT significantly contributes to treatment of rheumatic diseases. Appl Radiol.